With attractions 'Tortoise and Rabbit Run a Race', 'Cloud-Basin with Mythic Fungus Ganoderma', 'Moon Palace', 'Group of Dragons Play in the Water' and etc. 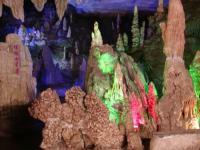 inside, the Seven Star Cave presents a true spectacle. Here below are the explanations for them all. 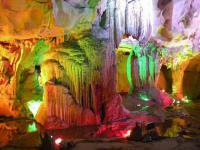 On the ceiling of the cave is a piece of stalactite which shapes very much like a red carp. It has a head, body and tail and the carp is going upwards against the current and you can see waves and water splashed behind it too. The water containing carbonates seeps in continuously through the clefts and drips off from the cave-top but again sediments and condenses inside the cave. Those, which condensed on the cave ceiling grow gradually downwards, are called the stalactites while those, which dripped off and condensed up and up on the ground, are called the stalactites. These condensed stone pieces no matter what they are, stalactites or stalagmites or something else are all growing from day to day, but very slowly. It grows only about 1~20 centimeters every one hundred years. The stalagmites are the counterparts formed on the ground of the drops dripping slowly down from the three stalactites above. There is a little white rabbit in the Seven Star Cave. It has eyes, mouth and ears. According to legend the little white rabbit once had a race with the tortoise that lived by the side of the Lijiang River. Running much faster than the tortoise the white rabbit got conceited. At that time there was a pheasant nearby, who, sensing the situation, became very anxious and shouted out by the roadside: 'Little rabbit, go on running and make efforts to run after!' Go further ahead, and there you'll see the pheasant shouting to urge the rabbit remained untouched and didn't take a little care of what the tortoise was doing. He stopped and slept on the way. The outcome is of course that the conceited lost the game. Why the rabbit we see today is not a white but a black one? That is because in the long past there was no lighting installment in the cave and those coming into the cave for visit had to rely on torches for it. Smoked the white rabbit gradually turned into a black one. The highest part of the Seven Star Cave looks very much like a vast expanse of blue sky above. Standing right in its front is a huge stalactite and stalagmite hill, which looks as if it were an old giant banyan tree in lush green. You can see it has a trunk and branches with foliages too. However its slightly swinging sprigs and leaves seem to afford a warm welcome to visitors to the cave. So people often say: The vast blue sky is always there waiting on guests and the old banyan tree affording them a happy welcome. Hence the scene is called the 'Old Banyan Tree Welcoming Guests'. There are many stalagmites, which look very like clouds in the sky where the clouds from a cloud-basin there with a mythic fungus ganoderma growing in it. It grows when the water goes up, and when the water disappears it disappears too. After a heavy rain a lot of water seeps in from the hilltop and flows into the basin, but no matter how quickly the water flows it can never submerge the mythic fungus ganoderma in the basin, hence the scene being named the 'Cloud-basin with Mythic Fungus Ganoderma'. That is a very charming and serene palace above on the cave ceiling that looks like the 'Moon Palace' or the 'Guanghan Palace' as well known in Chinese legend. In front of it there is a very big cassia tree with lushly growing branches and leaves. Standing under the tree is a fairy that is the very 'Moon Fairy Chang'e' much talked about among the people. The story goes like this' Chang'e, the lunar fairy and Houyi used to be a couple and Houyi is a legendary hero who shot down nine suns, leaving one in the sky and they lived in the world of humans. However one day, Chang'e alone ate stealthily all the immortal herbs Houyi brought back from the Western Queen Mother to share with her. Immediately afterwards, she left light as a feather and flew upwards into the sky and finally she came to stay together with her jade rabbit in the Moon Palace. Meanwhile, the saying about Guanghan Palace has things to do with the romantic but amorous Emperor Minghuang of the Tang Dynasty. A legend has it that one night on the 15th of the eighth lunar month Emperor Minghuang saw a huge palace known as 'Guanghan Palace of Serenity and Nihility' in his dream, and this was later passed on the lips of the people as the 'Guanghan Palace' in the moon. I've already discussed it over with the Cowboy. And I'm going to work as a weaver. Little white rabbit, run fast or you'll be lagged behind. The tortoise's gone ahead and you'll lose the game if still asleep. Over there on the stonewall we can see a toad. It is the toad, which we always referred to in the saying 'Toad lusting after a swan's flesh'. It has its mouth, and legs too with its head poking downwards as if it were ready to jump off from it. Legend has it that the toad had been together with the Moon Fairy Chang'e in the Moon Palace. As it overhead that Chang'e would like to go down to live in the secular world it decided to take the advantage. Sneaking out of the Moon Palace it came here to help look after the Seven Star Cave, hence the name of the scene 'Toad Descending to the Human World'. Seven Star CaveIn the Seven Star Cave there is a lengthy corridor in the shape of a new moon, which extends a scope of meters. The left stonewall looks very white and crystal-clear as if it were built of white pieces of jade, hence the name 'Long Corridor of White Jade'. The cave ceiling is also white and smooth, and is known as the 'White Stone Awning'. Here, if you treadle your foot on the ground it'll sound 'dingdong', hence the name 'resounding effect in a dale'. This scene came into being due to the pureness of limestone formation here. in ancient times the underground water flowed slowly and smoothly over here and so dissolved evenly the cave ceiling and wall, thus forming the 'Long Corridor of White Jade' and the 'White Stone Awning'. For another reason as the Seven Star Cave consists of three tiers, and so when you step and pedal onto the thinner part of the jointure between the first and the second layers it will produce a 'dingdong' sound. Seven Star CaveInside the Seven Star Cave there is a very deep pool called the 'Dragon Pool'. Legend has it that quite a long time ago there lived two dragons and a couple of lions here. Once in a year of draught, all waters were dried up and people were hard to go on living, but those poor peasants living nearby went to fetch water from the dragon pool. However, there was an atrocious tyrant who standing on their way, wouldn't allow them to. On hearing this, both the dragons and lions got very angry, and sending water to them while lions staying here guarding the pool. With the great help from them the people survived the year of draught. So when you go further on you'll see a couple of lions one on either side of the pool, hence the name 'A Couple of Lions Guarding the Dragon Pool'. Going further ahead along the tour route, you'll see over above a large stone pillar, which looks very much like a juniper tree growing on a precipice. With luxuriant branches and foliages it towers high into the sky, hence being called 'Ancient Juniper Tree Thrushing into Sky'. In the right of the tree there is a square mouth of a cave, which looks like an eagle with its head, wings and tail. Head upward it is ready to soar into the blue sky. Soaring into the sky are the juniper tree and eagle. Rifle in hand stands here a soldier. Brave as he is he fears no wind and rain. Guarding the frontier he's all there with heart and soul. Therefore, this scene is known as the 'Frontier Scenery'. This stalactite looks very much like a hat that hangs upside down from the ceiling. With head straightening downward its body is hanging downward its body is hanging up above with two wings on both sides. Legend has it that this bat was able to eat up 99,900 mosquitoes a day and so up to now there is no mosquito in the Seven Star Cave all the year round. The 'camel' has a head, hump and a tail, and underneath you'll see a lion, which has a head, feet and back too. Crossing over hills and waters they go along together with camel carrying the loads and lion leading the way. After walking for a while the lion will turn round to see whether the camel has followed up and it also seems like to tell the camel something, hence the scene being called the 'Lion Looking Back at the Camel'. Seven Star CaveIt's a scene looking very much like the large-sized clay sculpture 'Rent Collecting Courtyard', depicting in a vivid way the struggle waged by peasants against the landlord. Standing there with his hands crossed backwards is the landlord and the one having his waist bending over there is his stooge. Still other three figures are the peasants arguing and reasoning with the landlord. In addition, sitting here is an old man. This is his head, whisker and arms. Face beaming he's watching at what is going on in the 'Rent Collecting Courtyard'. He is seemingly telling the peasants 'you've done a very good job in reasoning with the landlord'. Here is a hippopotamus. You can see its head, eyes, back and tail too. In its front is a pond from which it has just been out as it is still wet all over. Feeling itching on his body it came ashore to scratch it. How clumsy and funny it looks like! So this scene is called the 'Hippopotamus Scratching His Itching'. Here is a frog, which, with its head towards the pond, is ready to plunge into it. Just look, how well it poses to jump, hence being called the 'Frog Jumping into the Pond'. Immortal casts the net, knowing no spring or autumn. And draws it in every five thousand. Alas! Long time's already elapsed, and so the net's rotten away. 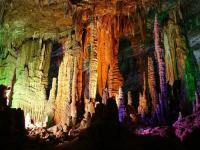 Here is a very nice-looking stalactite hill. Take a careful look at it, the stalactite and stalagmite on it look very much like cameos consisting of many ears of grain and wheat and sorghum too that are piled up like a mountain. This signifies a bumper harvest, a picture of flourishing prosperity. Therefore, people call this 'A hill of Grain and Cereals'. Upwards there is a huge serpent snaking out from the cave. But be calm and quiet for it won't be able to bite you. However, legend has it that this large serpent did kill and hurt many people in the past. One day sometime afterwards, there came a Hercules, who, determined to do away with this harmful reptile, came sword in hand into the cave for slaying the python. But seeing somebody's approaching the python, opening its mouth wide, hissing and thrusting out its thronged tongues, tried to devour him at one gulp. Sensing the critical situation the Hercules, brandishing his sword, hacked at the serpent with all his might. However, due to too much exertion the sword flew off his hand and stuck onto the cave ceiling. This set the python even more rampant but at the moment the Hercules, hitting upon an idea, lifted up a large rock and pressed onto the serpent body. Since then the serpent was suppressed underneath without being able to move anymore, but for always it had to stick its head out. Hence the scene is called the 'Huge Rock Suppressing the Serpent'. These tiny yellowish yet glistening stalagmites look just like drifting sand dunes and here on the ground is an elfish little lion rolling and climbing on the side. It has a head, feet and tail. Whoever sees this scene will exclaim: Little lion, trying to seize the sands, is making efforts to climb onto the sand-hill. It cares only to go up while paying no attention to slipping down and one careless move makes it rolling and somersaulting down the hill. Third Sister Liu, she's born a singer. Her crisp notes drift along hills above and over. And her songs make the people even happier. And Third Sister Liu will come reborn a child here. In the cave in front of us, there are a number of stalactites hanging down from the cave ceiling. Their shape are varied and of all descriptions as if they were dancing dragons of various sizes down from the heaven. Underneath on the ground there are also a few small dragons with their reflections in the pond as though they were real dragons, big and small, playing in the water. What a spectacle! On the vermilion wall flies a phoenix, the bird immortal. On the Flower and Fruit Mountain there are strange flowers and wizard herbs that will never go withering all the year round. In addition there are still green pine and juniper trees and all kinds of fruit trees as well. Seen among those trees and fruit are the big pumpkins, large white gourd, bananas, litchi, dragon-eyes, Buddha's hands, grapes and lotus-roots and spinaches as well. 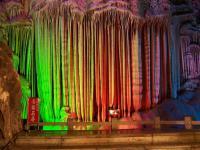 About this people all say: Sun Wukong, he eats in the Flower and Fruit Mountain and plays in the Water Curtain Cave. But please don't forget though the Flower and Fruit Mountain has many things to offer, and every year promises a bumper harvest you are only allowed to sit eating there but not to take anything away. This is a rule, which everybody here must observe. The stalagmite above looks very much like a baldheaded monk in meditation, who is the very Monk of the Tang Dynasty, being commonly addressed as 'Tang Seng' in Chinese. According to the hearsays the monk on the way of his pilgrimage to the west committed many ridiculous mistakes, always treating those demons as good people without defining the good from the bad, thus suffered a lot. One day, trying to save a Demon, and was induced into an octahedral trap. Fortunately the Monkey King came onto the scene in time and saved him, but the Monk was already all over in sweat. Having no way out the Monk had to take off his Kasaya and air it, hence the scene 'Monk Tang Airing His Kasaya'. Still further on you'll see the timid Pig, known as Zhu Bajie in Chinese. He, hiding himself up, was peeping to find out which way the wind was blowing. Afraid of being caught into the trouble he dares not to make a head or tail of it. You see on the stone wall there is a picture featuring hills and mountains veiled in clouds, hence the name 'Fresco with Hills in Clouds'. The main theme of the picture is the 'Scenery along the beach'. On the right is a boundless expanse of ocean and there is a ship on the sea. The left of the picture features a series of mountains and hill with trees, ivies, man and river on which spans a small bridge with a man walking on it, and you can see reflection of the man in the river. So this is a landscape picture full of life and poetic sense. I have a feeling within me seething. And hills in clouds are rolling to you. Studded with row upon row of buildings. To know where is the man here? He's behind the hill and the mist veil. Quite a long time ago, there were two immortals playing checks here for the hilltop was flat as a table, hence the name 'Checkerboard Hill'. Here is the broadest place in the 'Seven Star Cave'. Measuring 49 meters in width and 60 meters in length the total space is some 2,500 square meters, which is spacious enough to hold 3,000 people at time. You'll have a sense of magnificence here and the scenery is also quite splendid. This stalagmite looks very much like a banana tree in bloom. So it is called the 'Banana Blossom'. It seems to be in full bloom now and it augurs a rich harvest of banana this year. You are welcome to come for a visit again when the banana gets ripe. There is a sword that was stuck onto the cave ceiling. This is as aforementioned the very sword, which was once used by the Hercules to kill the giant serpent, and it flew off his hard due to his overexertion. Now it is called the 'Sharp Sword for Slaying the Serpent'. It is a place which seems to be a bridge and this is as said the very place where the Weaving Girl and the Cowboy meet on the 7th of the 7th lunar month every year. Therefore, people call it the Magpie Bridge. An ancient Chinese fable goes like this: the Cowboy and the Weaving Girl fell in love through their joint work together and later became man and wife. However the Western Heavenly Mother overheard this. Being unhappy about the marriage she deliberately laid a Galaxy between them, separating the couple on the two sides. And every year they were only permitted to meet once over the bridge on the 7th day of the 7th lunar month. Please look here on the left, this is the Cowboy with his two children and opposite is that Weaving Girl with her mates, and down there is the ruthless Galaxy. This scene looks like a stone forest in the distance, secluded and very much quiet too. As all these things are very tiny, so they look seemingly to be far in the distance hence the name the 'Stone Forest in Seclusion'. Legend has it that a long time ago there were two persons Gong Gong and Zhuan Xu by name (names of two kings in China's ancient times) who were locked in a battle here. Greatly enraged Gong Gong rushed headstrong at the Unstable Mountain and broke the heavenly pillar, thus making the heaven collapsed in the northwest and the earth declined at the southeast. At the crucial moment there came a Lady by name of Nvwa. She, decided to save the masses of people out from great sufferings, picked up many pretty stones and by making great efforts day and night she got them melted for sticking together the heavenly pillars and for mending the disrupted part of the heaven. You see this is the very place where the Goddess - Nvwa mended the heaven. These are the guards on duty for keeping watch at the entrance and there is also a lion here to assist them. Here is a cluster of stalactite, called the 'Eighteen Children Hanging Upside Down on a Lotus Flower'. Please look at it carefully and start up your thinking tank to see whether there really are eighteen nudes suspended upside down on the lotus flower. This is a motley stone of five colors, which is different from other stones in the cave. If you think it is formed due to the condensation of the water dripping down from the cave ceiling above you can't find any traces on it, but if you deem it to have been growing out of the earth its tip underneath is yet separated from the ground. So people say it is a piece of motley-colored stone the Goddess Nvwa gathered for mending the cleft of the heaven. The jutted part here looks very much like two little lions. Lively and lovable they are vying with each other to go up the hill. However, it seems that the lions on the left is a bit stronger and it has already parried the one on the right to the side. Please make a guess what they want to do? Oh, they all like to see the giant panda, a vital and lovable panda in the Seven Star Cave. The giant panda is playing freely over there. Here is a person whose name is Ye Zigao. As he was known as a person of morality and virtue he was addressed as Lord Ye. However, this Lord Ye had a hobby, a genuine love of dragons. His seat was carved with dragons, clothes embroidered with dragons and here was another lying dragon carved out in a very exquisite way. Then his liking of dragons was overheard by two real dragons living in the Hidden Dragon Cave and Dragon Crags, who would very much like to make friends with him, he, scared out of wits, fell over and went beside himself at once. In the scene, Lord Ye is still dithering without being able to stand upright now. Hence the scene is called 'Lord Ye Loves His Dragon'. Overheard above is a round moon, but it has got a halo round it and so it is a bit hazy. This is what we call the 'hazy moon with a halo', or known in Chinese as 'Maomao Yue'. A folk saying goes like this: 'When the moon gets hazy grass will fly up and trees start to sway,' and 'when it carries a halo round it you must not forget to bring umbrella out.' This means the hazy moon foretells the wind and rain. But you needn't be worrying about it. It doesn't matter even if you've failed to take any rain-gear with you for the moon in the Seven Star Cave carries a halo all the year round. This huge rock looks very much like a giant elephant. If you go into it by the side of the elephant trunk you'll get into another cave like a giant elephant and the cave is just inside its big belly so the scene is called the 'Fantastic Elephant with a Strange Cave'. They look like the combs or the other kind of double-edged fine-toothed combs, which we use in our everyday life. As the hill is fully covered up with all sorts of combs, hence the name of the hill. What we can see here is something looking like two snakes, which are vying with each other to get into a hole. But you'd better be careful. You are allowed only to take at but not to touch them, or they'll turn back to bite you. This is a very deep pit, so deep that it's hard for you to get down to its bottom. But actually the pit does have its bottom. According to studies, the pit holds a kind of water containing certain amount of carbon dioxide. The pit came into being through a long process of dissolution by such water tricking down along a vertical cleft, and it is now fathomed to be 23.5 meters in depth. The hole at the bottom is connected with the ria with its water emptying into the Lijiang River. There are through with one another via the underground watercourse. Besides, there are varieties of fish in the water underneath and they are eatable if you can catch them. This group of stalactites looks very much like a peacock in his pride, colorful and very pleasing to eyes. As this peacock is very hospitable and he is very happy on hearing that you are coming here for visit. So he comes out in his pride to extend warm welcome to you all. His mouth is wide open as if to say: 'Welcome, you are welcome!' 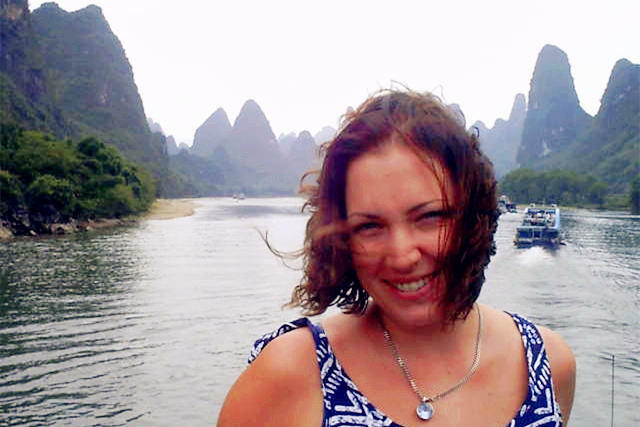 So it may be put into this way: 'In Guilin even hills and waters are so hospitable to guests and no guests and no dissolved cave here is unfriendly to visitors.' 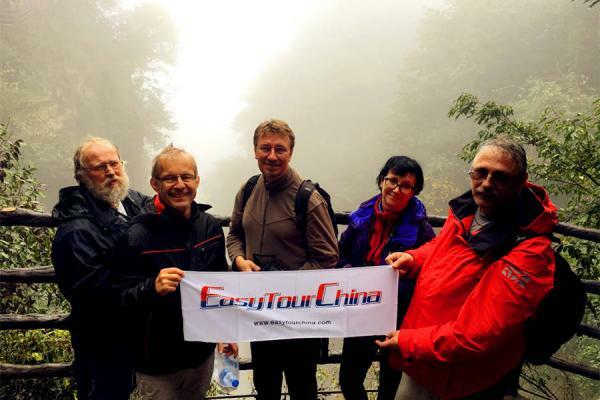 This indicates an atmosphere in which even landscape here is so hospitable to guests as do the people living here and you'll get the warmth felt wherever you go in Guilin. Here is a scene, which looks very much like a gift for congratulating the birthday. In an old yet delicate vermilion ceramic tray lays a big peach of immortality, hence the name 'Birthday Congratulation Peach of Immortality'. This is because peach, according to the Chinese traditional custom, is the symbol for the celebration of happiness and longevity.